This program mines articles in the New York Times home page, and using a dictionary and syllable counting algorithm and a few filters, discover sentences that can be cut into the shape of a haiku. The output of this generator is vetted by NY Times journalists, who identify the best ones for publication in the Tumblr blog, after generating background art based on the first line of the haiku. 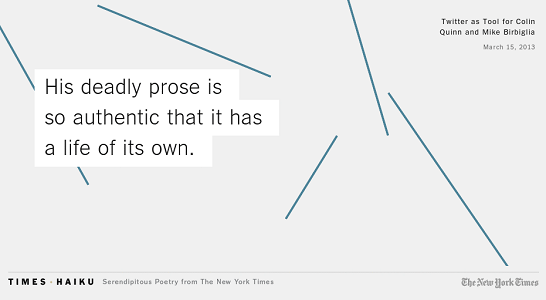 Read Harris’ about page for more details on this breakthrough in generative poetry. Readers familiar with this blog or with the long tradition of generative poetry may wonder why I describe this project as a “breakthrough,” since electronic poetry has had a long acquaintance with the generation and discovery of haiku. Haiku generators have been around at least as early as 1967, as documented in John Morris’ “How to Write Poems with a Computer” (thanks to Allison Parrish for the lead). Some of the earlier ones explored in this blog are “Free Haiku!” (2002) and “Exquisite Corpse Poems” (1996) both of which use relatively simple mechanisms to produce haiku, yet produce results that employ and challenge the tradition. Generation alone is a simple enough feat, evidenced by the 28,600 hits yielded in a Google search for “haiku generator.” What makes haiku generation interesting is the complexity of its algorithm and the quality of its data set. For example, Scott Rettberg’s “Frequency” (2011) generates compelling haiku because they are selected from a set of lines he wrote guided by carefully designed constraints. The time of the individually authored data set seems to be passing, as seen in a contemporary generator, Nanette Wylde’s “HaikU” (2011), which allows its audience to contribute lines to its database. Databases are among the most powerful tools placed at our disposal in the contemporary Web, including sophisticated dictionaries and massive and ever growing data repositories, such as Twitter and The New York Times. Two automated haiku finding Twitter bots recently reviewed in this blog are “Tweet Haikus” (2013) by Brandon Wood and “HaikuD2” (2012) by John Burger. Wood has published his source code and explained how to create a similar bot, if anyone is interested, though it is not as refined an instrument as Burger’s earlier bot, which also gives back to the original authors of the tweets. Both of these credit the original source, as does “Times Haiku.” As may be evident from this brief survey, there is nothing particularly groundbreaking in this project, from a technical standpoint. From a cultural standpoint, this is an important moment for generative literature, (which has a rich history and corpus of its own) because it has begun to be recognized and produced in mainstream sources. For the flagship of American journalism The New York Times to legitimize this kind of generative literature by producing and publishing its results, even when hedged by an essay as humble as Harris’, is a sign that electronic literature is entering public consciousness. It is now time to remind the public that literary experimentation in digital media wasn’t invented today, and that they should learn about the body of work that preceded it. Is it prophetic for this news to break on the week of the first Electronic Literature Showcase at the Library of Congress with an exhibition curated by Dene Grigar and Kathi Inman Berens titled “Electronic Literature and its Emergent Forms?” I think so.